For at least two millennia (maybe more?) people have felt as though the end of the world is upon them. Apocalyptic literature appeared on the scene around the 2nd century BCE and continued in the Jewish world until the middle of the Middle Ages and continues to this day in the Christian communities. Certain streams of contemporary Christianity are so immersed in eschatology that the Left Behind series are still the best selling novels in the United States. It is no wonder then that radio host and self-styled biblical scholar, Harold Camping, has made so many headlines in the last few days. 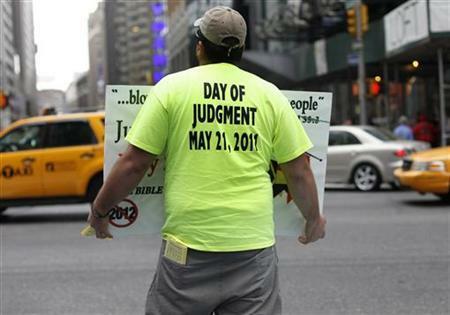 Starting a year ago or more, Camping, who runs a number of Christian radio stations and two television stations, spent millions of dollars advertising May 21, 2011 as the beginning of the End of Days–needless to say, May 21 came and has almost gone. No word has yet been heard from Camping, who had previously predicted the apocalypse would commence in 1994. Many have called him a false prophet, and I think that is too generous. There are two possibilities, in my opinion, as to what’s going on with this man. 1) He is an utter fool and a moron; 2) he is a brilliant marketer who has set himself up to increase his personal wealth from over $17 million to God only knows how much he might make. There is a difference between a false prophet and someone who is just plain wrong or an idiot. Unfortunately, there are far too many idiots out there. First off, let me say that I consider anyone who believes the world will end in apocalyptic fashion to be a fool, moron and idiot. The world is not going to end. Now, anyone who believes someone who believes the world will end, they’re just a whole new level of stupid. I don’t care if we’re talking Y2K, or the Hebrew year 6000, or 2012 in the Mayan calendar or any other end of the world scenario–it’s narishkeit. It may be instructive to understand that the original conceivers of the genre of apocalypse literature seemed to have been writing about their own time, not some distant date millennia in the future. What’s more, I have no reason to believe that anyone in the ancient world believed it either. Literature is entertainment, those who take writings literally are missing the point. So here’s what I’ve been thinking about the last week or so as I’ve seen the May 21, 2011 billboards and truck ads and read about Harold Camping incessently in the news for days. Here’s the difference between Christian and Jewish eschatology–the prior is about practical application, whereas the latter is (and I would argue has always been) a metaphorical representation of a utopian future. There have been hiccups in our history where we’ve forgotten that we’re dealing with metaphor–Bar Kochba, Shabbtai Tzvi, Jacob Frank, Menachem Mendel Schneerson (The Lubavitcher Rebbe). We apply a real-life messianism to leaders and become confused when our desires for a greater world conflate with the potential of redemption. Yet, as long as we focus on these prophecies of end times or on false messiahs, we forget that it is our job to bring redemption and we do that by pursuing justice and perfecting Creation. If Harold Camping had taken his millions of dollars and fed the hungry and clothed the needy, he not only would have been living up to the virtues of Jesus and his disciples, he would have been making real change in the world–but he didn’t do that. He squandered money raised from advertising and spent it on advertising… And now it’s nearly May 22 and he’s still rich and the poor are still poor, and no one has been raptured. For the life of me, I cannot understand what drives an individual towards believing in this kind of BS. There are people who quit their jobs, left their families and traveled around the country spreading the ‘gospel’ of the End of Days being upon us. And how they have no rapture, no redemption, no income and no life. I can’t say I blame Camping, but he certainly played a part. Well, the fact is there just aren’t that many Jewish eschatologists or messianists (and most of them are fringe Chabadniks). So what do we do with all of this End of Days nonsense? Well, for one, I think we should ignore it as most we can. What gave the May 21 people so much steam was all the attention they received from adherents, detractors and the media. The best way, in my opinion, to neutralize fringe elements is to ignore them. But more importantly than ignoring, we should be motivated in our efforts to heal the world, to bring justice to our nations and secure a peaceful future for the Earth’s inhabitants. Our messianic narrative has inspired numerous interpretations within the Jewish tradition, however, we have generally steered clear of End Days prophecy. I find this fascinating. Even those Chabad messianists who believe that the Rebbe never died or (even worse) believe that he will return, don’t seem to dabble in End Days predictions. I’m curious what people think–why do Christian eschatologists focus so intently on the rapture, apocalypse and armageddon rather than the return of their messiah? And, I’m also curious–were there to be a Jewish eschatologist swaying others to prepare for the End of Days, would they get as much media attention as the fundamentalist and/or evangelical Christians who hit the headlines? And finally I’m wondering, how many Jews would have been running to get baptized if his predictions were true? A Jewish Tale from Lithuania. "Welcome to Hitler&apos;s Cross, may I take your order?" Next PostJudgment Day November 14? Remember it is said that Noah got into his boat house One Week before it started raining. We have to wait out the week to see for sure. First we have to see the dead rising, before we die ourselves. Alright, Dennis. I’ll be back in a week to tell you to shut it. And finally I’m wondering, how many Jews would have been running to get baptized if his predictions were true? Wouldn’t it be too late by then? I thought you had to get right with the Lord before the day of judgment. And what can you say about why apocalyptic literature died out in the Jewish world in the Middle Ages? I’m curious about that, because it’s certainly not like things got awesome for the Jews all of a sudden. Oh yeah, Dennis, where is the clockwork earthquake that was supposed to happen on the hour in each time zone around the globe? Remember, that was supposed to happen on May 21st? What other excuse for your self-deceit can you think of? Oh, God spared us because he saw that mankind has changed and now we are all going to be kind and loving and put the hate aside. We must all be redeemed! Yes, there will now be world peace, right Dennis? Osama Bin Laden is dead, so we’re all going to treat each other differently while we all join hands like little flower children and rejoice together with complete strangers in the street and act like next week we aren’t cutting them off in traffic or robbing them in alleys. Let’s all hold up a sign for our own vanity and sin in favor of our pathetic delusion of receiving the credit and glory of everyone to look into our eyes in their last moments knowing that we as stupid sheep followed a single lunatic to be viewed as gifted and so pious; for we are NOT fools, but messengers. We’re special. We’re chosen ones. And then when we’re wrong, we’ll all deny our own wickedness and deceit without quiet shame and reinterpret everything with cognitive dissonance because we threw away our homes, possessions, and most importantly, our families. Look at your hubris. Look at how you’ve all ruined your pathetic lives. When you’re sitting at the card table and can’t spot the sucker, you ARE the sucker. Imagine the terror you would feel if one day you weren’t blind. I believe that All Shall go to heaven, for a time. Then we shall be on earth again. Even uzi shall be there, heaven and then earth. As I have always said: religious faith is a form of mental illness !! why are people so gullable i feel sorry for the brain dead people that believe in this bs. There have been hiccups in our history where we’ve forgotten that we’re dealing with metaphor–Bar Kochba, Shabbtai Tzvi, Jacob Frank, Menachem Mendel Schneerson (The Lubavitcher Rebbe). We apply a real-life messianism to leaders and become confused when our desires for a greater world conflate with the potential of redemption. Well, the fact is there just aren’t that many Jewish eschatologists or messianists (and most of them are fringe Chabadniks). Justin, before you go throwing stones at Christian end-times believers, you may want to take a closer look at our own Jewish glass houses. Just a few ‘hiccups’, you say? Not that many Jewish messianists? Have you looked at most Orthodox siddurim, as well as that of the Conservative movement? : “Bless the State of Israel, the beginning of the flowering of our redemption.” This is nothing if not messianic: and it is recited in many, many shuls. If this is a hiccup, it’s a pretty widespread one today. Furthermore, in relation to traditional rabbinic ideas, I’d say that the idea of a ‘Jewish state’ is inherently messianic, whether or not people use that language or consciously think of it in those terms. So if you look around at the number of people who voice support for a ‘Jewish state,’ it certainly seems to be the case that the total number of messianists far exceeds the adherents of Chabad, and maybe command even a greater percentage of Jews than in the case of the Sabbatean messianic upheaval. Now, far be it from me to insist that this is necessarily a case of false messianism. Perhaps the State of Israel really does represent the true messainic flowering. And perhaps the Lubavitcher Rebbe really was/is the messiah. And perhaps Shabbatai Zvi really was/is the messiah. But, regardless of one’s judgments on each of those particulars, one should at least call messianism messianism. In this regard, compared to the widespread ‘success’ of Zionism, Harold Camping looks like a piker. Furthermore, in relation to traditional rabbinic ideas, I’d say that the idea of a ‘Jewish state’ is inherently messianic, whether or not people use that language or consciously think of it in those terms. ראשית צמיחת גאולתנו is one thing, but here you’re going too far. When Herzl envisioned the “Jewish state”, he wasn’t thinking about traditional rabbinic ideas of messianism. What about what Christ said that “not even he knows when he will becoming back. Only his father knows” Being a Christian is not a bad thing but being duped is. If any one says hey I know when the end of days is going to happen they are actually calling Christ a liar. Think about that. BZ–yes, certainly Herzl wasn’t thinking about traditional rabbinic ideas of messianism. My main point was that the traditional rabbinic conception was that the restoration of Jewish sovereignty was going to come about only in the messianic period. So, from that perspective, regardless of the way Herzl or others viewed it, the push for restoration of Jewish sovereignty would be inherently messianic. Likewise, David Ben-Gurion frequently described the Zionist project as a messianic endeavor, even if he too was obviously altering the traditional conception. So, yeah, I’d still say that there’s a messianic elephant in the room. It may be a true messianic elephant or a false messianic elephant, but it’s definitely there. I’m not buying it. There is also a tradition that the messiah will come in riding a donkey. Does this mean that anyone who rides a donkey is “inherently messianic”? ben azzai is of course beating a dead horse, and Justin, in his excellent post, articulated in a few words a mainstream Jewish attitude towards messianism: a metaphorical representation of a utopian future. While the early Zionist expectation of an end to galut may have been real to some, it was a political and not an eschatological statement, that was essentially put to rest when it became clear that the USA was in fact a goldeneh medineh where Jews and Judaism and Jewishness could flourish. Even those who recite the beginning of the blossoming of redemption do so without assigning a date or a time certain; and a messianic hope is different from a messianic expectation and even than any articulation of bimherah u’vyameinu. I don’t want to put words or thoughts into anyone mouth or brain, but it seems to me that Dennis is joking and ben azzai is posturing. Someone tell me, please, if I’m wrong. I’ll leave it to others to decide whether I’m posturing or not, but Larry Kaufman’s statement that “it was a political and not an eschatological statement” seems indicative of conceptual confusion here. One of the things that is often emphasized about rabbinic Judaism is how (in contrast to many streams of Christian tradition) it does *not* create a sharp separation between ‘the political’ and ‘the eschatalogical.’ While it would be a longer conversation, I’d say that the separation of the eschatalogical from the political is largely a very recent, primarily 19th/20th-century development within Jewish theological thought. And, among others, Gershom Scholem was very concerned about what he saw as the “apocalyptic sting” that was still latent in ostensibly ‘secular’ political Zionism. Also, you say “Even those who recite the beginning of the blossoming of redemption do so without assigning a date or a time certain.” This is not true: the beginning of the blossoming of redemption is assigned to a very specific date and time, namely, the establishment of the State of Israel. I agree that many ‘mainstream’ Jews might not consciously think about it in messianic terms, but the messianism is still there. In logical terms, it was: Messianic era implies Jewish sovereignty, and Jewish sovereignty implies messianic era. By contrast, messianic era implies donkey-riding, but donkey-riding does not imply messianic era. I think there are some points in your comments that are right on, but some are a little too far over the mark (even for me). I do agree with you that Zionism has an inherent messianic element to it–I think that all nationalist liberation movements need to have that element. The notion that political revolution will bring redemption is not a uniquely Zionist idea, though–it was also the basis for the American Revolution, and they were also messianists in a certain regard. But none of this latent messianism is eschatological. this is an overly simplistic depiction of the messianic narrative as recorded in the Talmud, Rambam and Saadiah Gaon–it’s much more complex than sovereignty alone. Yes, I agree that there may be elements related to messianism in all nationalist movements. But, there is still is still a difference in the case of Jewish nationalism and Jewish messianism. In the case of the American or French revolutions, there was not an established notion of ‘there will be American/French sovereignty only with the coming of the Messiah.’ In contrast, the established rabbinic tradition was ‘Jewish sovereignty will come about only with the coming of the messiah.’ For this reason, specifically within the Jewish tradition, the restoration of Jewish political sovereignty was conceived of in inherently eschatalogical terms. So when notions like ‘redemption’ and ‘ingathering of the exiles’ were used in the Zionist context, something qualitatively different was going on, in comparison to other nationalist movements (even if there were also similarities to other nationalist movements). The Jewish situation, and the traditional Jewish self-conception, was not ‘normal,’ and hence Jewish nationalism could not easily be ‘normal’ either. Sure, there is more complexity, but I still would say that the Talmud, Rambam, and Saadiah Gaon all held that Jewish sovereignty would be restored only with the coming of the messiah. I’m really not trying to whether modern Zionism is ‘good’ or ‘bad’–but simply that the notion of Jewish political sovereignty, from the perspective of traditional rabbinic theology, is bound up with eschatalogical messianism–not necessarily ‘earthquakes bringing about the end of the world’ eschatology, but eschatology nevertheless. doesn’t the Rambam you quote move the Jewish conversation squarely away from eschatology? If ‘nothing in reality changes from what it is now’ then קץ ימים is something different than “End of Days” like its meant in Christian eschatology. beware of the false prophet,where is he know!what about the people that believed in his teachings!Will there ever be a second coming of christ?Only GOD knows the time.I feel sorry for the people who truly believed in this man,are thay still true believers to the word of GOD or Disillusioned by the whole thing. What about the monie they have given to save there souls,will he give it BACK! Sure, as I said, it is not necesssarily an earthquakes-destruction-of-the-world eschatology. But, eschatology simply means ‘study of the last things,’ and the messianic era is surely part of that. So, I’d still stand by my assertion of Zionism being inherently messianic/eschatalogical from the the perspective of traditional Jewish conceptions. And, in terms of conflagration-causing forms of things, the settler-colonization of the West Bank seems highly linked to Jewish messianism and could easily be described (on an ethical level) as ‘crazier’ than Harold Camping’s calculations. Is this really that controversial? I realize there can be debate about moral/political judgments, etc., but the strong conceptual connection to Jewish messianism seems pretty straightforward to me. This is not to say that it can’t also be linked to nationalism. As you point out, messianism and nationalism can often overlap. But that doesn’t detract from the messianic aspects. Christianity is an outgrowth of Judaism. It became a ‘Church’ religion after Constantine took over to make it work for his estate. Christianity is different from the Church! You all know that. You also know that Judaism took over Khazars who become Jews of to-day. Nevertheless all shall be saved for the day, because Jesus Christ only spoke to the Jews in Israel, He saved the whole world, all peoples from Cain to the last man. This is the last week we shall live on earth of to-day. Followers and believers in Harold Camping’s prophecy’s.